Nasco ChairMate. 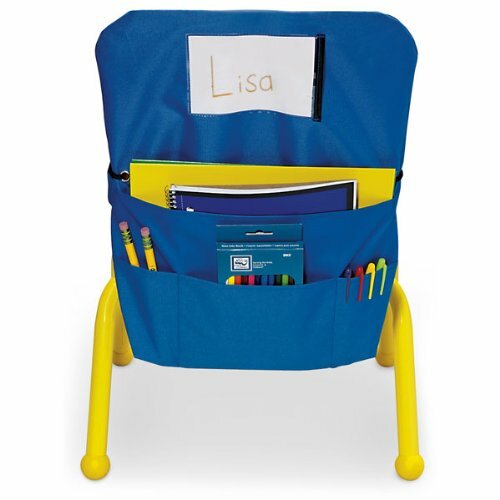 The flanged edges on the side allow it to slide easily on and off the chair back, fitting most plastic-molded and wooden ladder-back classroom chairs. This design feature also helps prevent the ripping of seams. Front pockets provide ample storage for folders, books, supplies and other personal items. The ties on each side provide a snug fit when on the chair. The 3-1/2-inches x 5-1/2-inches clear name tag holder has a reinforced edge at the opening to prevent tearing. Made of durable polyester material, with reinforced seams throughout. Easy to clean with soap and water and a damp sponge or cloth. Hand wash only. Fits most 10-inches H, 12-inches H and 14-inches H chairs. Measures 16-inches width by 17-inches height. 1 Year warranty on material and seams. Warranty voided if machine-washed, if overloaded with heavy books or supplies, or if misused. Available in small size and blue color. Lead and phalyte free document. Rubbermaid Commercial Trades Cart, 2-Shelf, 19-1/4w x 38d x 33-3/8h, Black - Includes one each.